Digital Champions are people who help to support the process of digital inclusion. This is generally considered at a very practical level: that of showing a person how to do something online, in a way that helps them increase their skills and confidence. The term digital champion has also been used for a leadership function (with the most famous digital champion being Martha Lane Fox, who was appointed into the role for the government in 2010). It is more common nowadays to refer to these kinds of champions as Digital Leaders, perhaps due to recognition of their value through the annual awards and efforts to ensure those adopting this role are able to network and share good practice. A Digital Champion helping a learner get to grips with using a tablet. Digital Leaders include people who understand the vital role of digital inclusion in service transformation and who work to ensure their organisation addresses the issue. They may identify other key people in their organisation who would benefit from a greater understanding of digital inclusion issues, so they can act as a champion within their own department or committee. Digital Leadership awareness raising and training activities for senior executives, elected members, Boards and Trustees is therefore a useful piece of activity in the digital inclusion landscape. 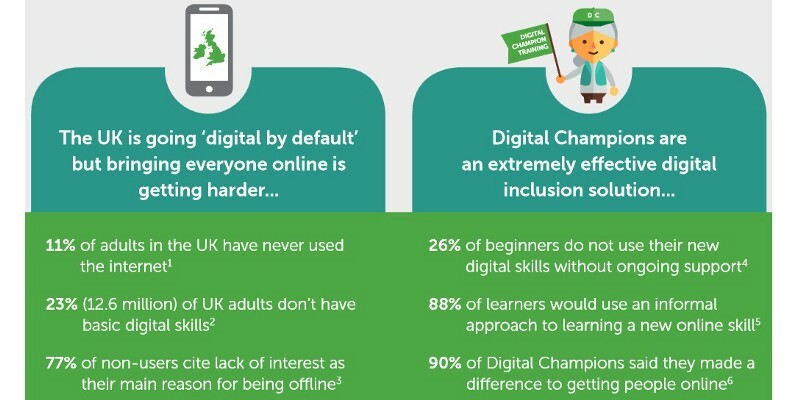 Excerpt from Digital Champions infographic by One Digital, noting that 90% of Digital Champions said they made a difference to getting people online. In this blog, I want to focus on an overlap area between digital leaders and digital champions: when digital champions are deployed in a strategic way to support service transformation and other organisational agendas. Digital Champions can and have been the focus of, to my mind, rather grandiose plans to get everyone online, by creating some kind of army of willing volunteers to go round and train up others to join the internet age. It sounds like a great approach, especially since it appears to be free! When Francis Maude re-announced the approach, almost as a new idea (“digital friends”), I was there to challenge him on whether lessons had been learned from previous attempts to hit big numbers and “solve” digital inclusion. Here’s the issue. Digital exclusion is a feature of our deeply unequal society. It is a systemic issue and not simply related to an unfortunate lack of skills and confidence in a few sets of people. 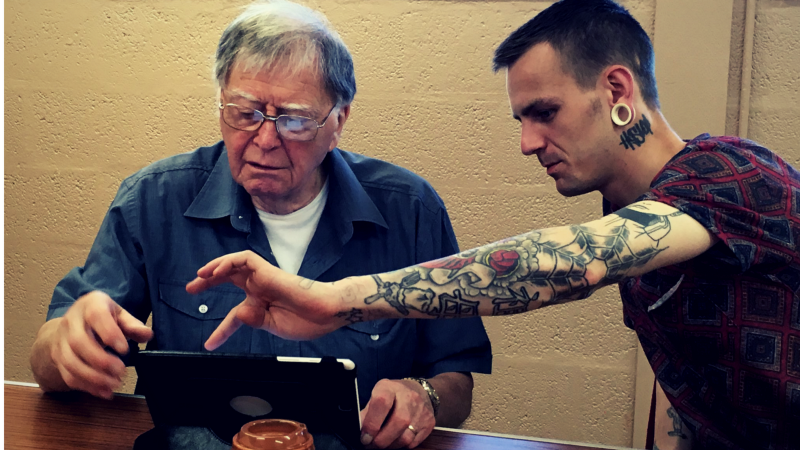 The digital champion idea — that a friendly informal person teaches someone else how to get online — makes sense to us: we all have our stories of teaching our dad how to look things up or helping our grandparent with a new iPad. And indeed, encouraging people to teach each other is no bad thing. Except I suspect people do that anyway — we are all getting little lessons here and there. The main change regarding technology uptake is that companies have made devices cheaper and software more intuitive. This, I warrant, has been one of the greatest contributing factors to digital inclusion. Digital Champions get involved in local online centres (libraries and community hubs, etc) and decide to play an ongoing role in supporting people to get online. These folks are gems. We celebrate them (and some win awards) when they come into our programmes for digital inclusion. So what useful role can digital champions play within the digital inclusion arena? What strategic possibilities exist for digital leaders to implement? It feels useful to firstly define some different types of digital champions. Having the right type of Digital Champion with the right training in the right place can support communities in a variety of different ways. Through experience, we have identified a number of different types of digital champions and contexts in which they can work and be effective. We believe having a blend of different digital support types is the best way to achieve inclusion. Professional Digital Champions (Dedicated Mobile Workers / Outreach): these are people who can be recruited into the staff team of an organisation or partnership to work across a community. Digital Championing is their sole purpose! They are employed to deliver training, plug gaps, test for the needs of citizens and provide professional, knowledgeable, basic digital skills provision. These digital champions are the most flexible and able to provide many benefits and outputs due to their dedicated focus (however, they are a more expensive option to resource). They can be deployed in communities with lower social capital. Embedded Digital Champions (digital help as part of someone’s role): these are people who work for an organisation in a specific role, often in customer facing environments. When they have capacity, they will show a person how to use digital technology or where they can find further help, signposting people to other resources and training (this might include using a signposting tool such as these for Gwynedd and Brighton and Hove). Volunteer digital champions (dedicated mobile workers / outreach): much like Professional Digital Champions, volunteers can be recruited and trained by an organisation or partnership to support digital inclusion work. In some cases our own Citizens Online volunteers have gone on to paid roles. It is worth bearing in mind that volunteers don’t come “for free”. Management time is required to recruit, train and support them (and they may leave the project at any time). In our experience while there are huge benefits to volunteering (for both society and the volunteers themselves) a digital inclusion project hoping to succeed through volunteering energy alone is unlikely to succeed (as discussed above). i. Frontline Champions: Examples are Job Centre Plus staff showing a claimant how to do a job search, housing association staff showing how to report repairs online, local authority staff showing how to use the authority’s website and library staff helping citizens research their hobbies. Sometimes staff can act as ‘sessional digital champions’ during specific times of need, for example work clubs run within libraries. ii. Community Champions: For example, staff and volunteers within community and voluntary organisations who support their client base with specific online needs. This can include advice and guidance, access to benefits and a range of activities to boost employability and self-confidence. This could be staff or volunteers within a Citizens Advice or Age UK branch for example, a community befriending service or social housing residents’ group. iii. Team Champions: For example, key people within a staff team who provide basic digital skills support to their colleagues. This could include members of a Digital Transformation Team, HR or Training department that are employed for some of their time to help initiate organisational change and workforce development. By creating a holistic approach to digital champions across an area (Citizens Online’s Switch approach can help map needs and gaps) it is possible for service providers to focus on digital first approaches alongside assisted digital. A digital inclusion strategy for the UK, then, needs to take its lead from area–based approaches, with digital champions at its heart. And for digital leaders, getting the right blend of digital champions to work to provide a holistic support and located across an entire community needs to be at the heart of any digital transformation strategy. Citizens Online works with our One Digital partner, Digital Unite, to support people to become digital champions. Their Digital Champions Network is an interactive website that provides learning, tools and a friendly community to help Digital Champions. 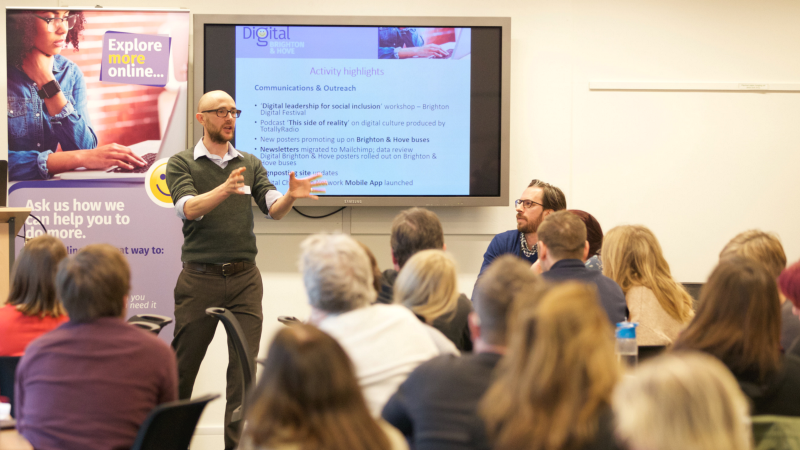 Since 2015, One Digital has recruited 1,800 Digital Champions and Digital Leaders, engaged 1,405 organisations, and helped 13,559 people with digital skills. Citizens Online have worked with 670 Digital Champions across 4 very different locations to test out our model.